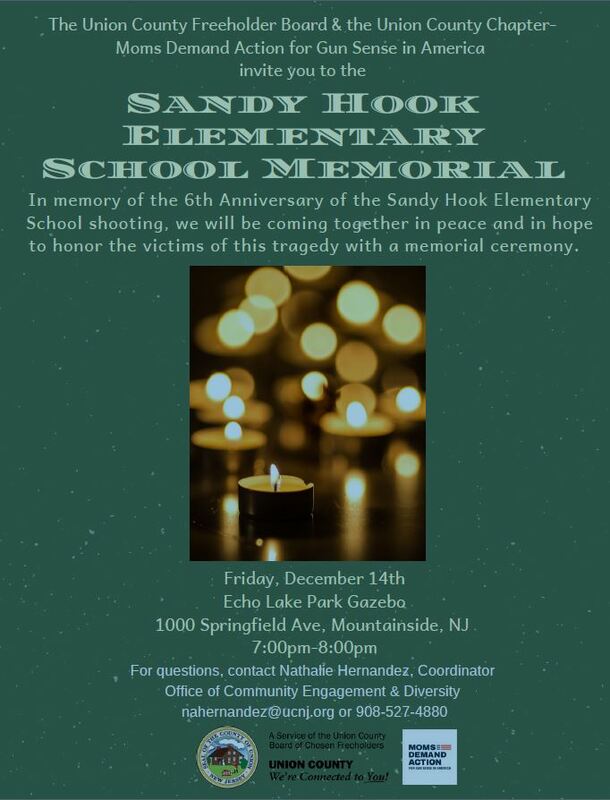 Union County, NJ – The public is invited to join with the Union County Board of Chosen Freeholders and the New Jersey chapter of Moms Demand Action for Gun Sense in America to honor the memory of the 26 children and adults who were murdered in a single act of gun violence at the Sandy Hook Elementary School in Connecticut in 2012. The memorial ceremony will take place on Friday, December 14, from 7:00 p.m. to 8:00 p.m., at the Gazebo in Union County’s Echo Lake Park, off Route 22 in Mountainside. As part of Chairman Granados’s “Moving Union County Forward” initiatives for 2018, the Freeholder Board has partnered with Moms Demand Action to advocate for common sense gun reforms. Last April, the Freeholder Board joined Moms Demand Action and the mayors of 14 Union County municipalities to sign a Statement of Principles in support of the Mayors Against Illegal Guns campaign. Moms Demand Action was founded by stay-at-home mom, Shannon Watts, on December 15, 2012, in response to the murders at Sandy Hook Elementary School. The organization quickly flourished into a leading force for gun violence prevention as part of the Everytown for Gun Safety Network. With grassroots chapters in all 50 states, Moms Demand Action has successfully effected change at the local, state and national level. To join the New Jersey chapter, email pficoucmoms@gmail.com. For more information about the national Moms Demand Action organization visit momsdemandaction.org. For more information about the December 14 event contact Nathalie Hernandez, Coordinator, Union County Office of Community Engagement and Diversity at nahernandez@ucnj.org or 908-527-4880. The Office of Community Engagement and Diversity is part of Chairman Granados’s “Moving Union County Forward” initiative for individual empowerment, education and community service. More information about the office is available at ucnj.org.